Safety tested and certified to BS EN 1888 and BS EN 1466 for the UK and Europe  Silver chassis with 2 smaller wheels at the front and two large wheels at the rear. Free raincovers  Lightweight aluminium chassis weighing 9.5kg with out seat to fit into car boots or 16.kg with both seat units  Multi-position, from lie-flat reclining seat, to snooze and full sit up position.  Lockable front swivel wheels which are great for busy shopping malls or fixed wheel position for bumpy terrain or rough pavements  Compact folded size with wheels on 34 cm depth x 92 cm length x 65.5 cm width.  Compact folded size no wheels on 39 cm depth x 86 cm length x 55.5 cm width. (it is preferable to remove the rear seat for folding in car boots) Soft grip handle for comfort and control  Adjustable handle height ranges from 89 cm to 104 cm ideal to accommodate all heights  In-built suspension for a comfy bouncy z sleepy ride. Padded comfy seat unit  Adjustable calf support. Spacious shopping basket  Detachable extending shower proof hood with viewing window  Seat width 33 cm & depth 12 cm The perfect twin travel system Kidz Kargo Dual DS Combi A compact and easy fold pushchair, and suitable from birth. Designed to fit 1 Kidz kargo safety car seat (birth to 15 months), allows easy travel without disturbing babies making this an ideal travel companion. Versatile. 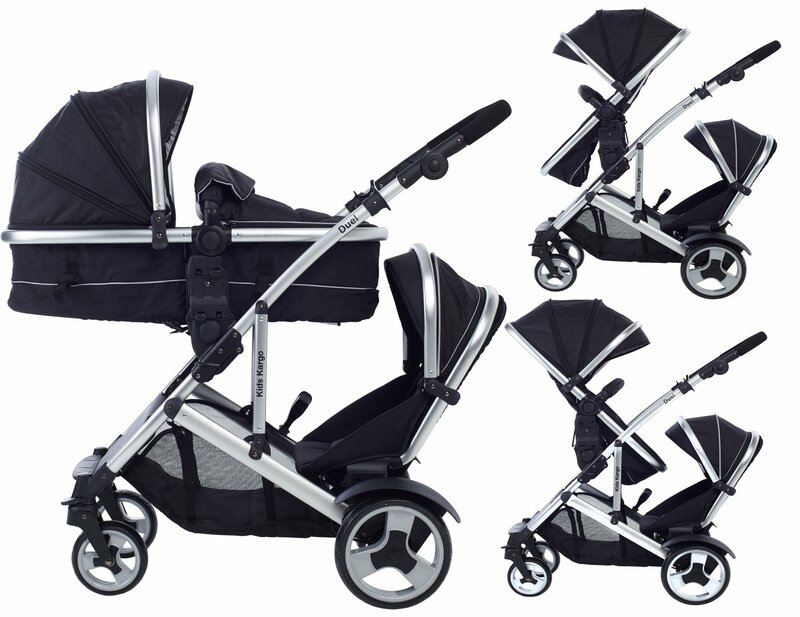 Suitable for Newborn and toddler: Carrycot with mattress and soft lining, which zip off. Remove lining and lid, when baby grows out of carrycot mode. Converts to a full sized seat unit, with 5 point harness. Carrycot fits on the chassis in the top position. n-built suspension, adjustable handle, complete with rain covers .